Frank Cashen earned five World Series rings as an executive. His death at age 88 raises a question for me as a hobbyist. The Orioles and Mets are well-collected teams. I was stunned to check the always-amazing www.sportscollectors.net. The good news? Cashen was a 100 percent responder, signing for everyone who wrote. However, only 16 collectors made attempts. 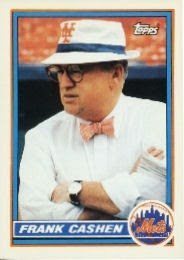 In fact,the general manager surprised a few collectors who wrote, sharing extras of the rare 1992 Topps card made of himself for a special ceremony. Miss the one-day event, and you wouldn’t have gotten the card. The Hall of Fame will be selecting more owners and GMs in the future. Often, the men don’t get honors until they’re deceased. I wrote him a couple years ago to ask him to sign my Mets team card for my 1989 Topps set. He not only signed it, but included a signed copy of his personal card that you have pictured above. Congrats on a nice prize, Eric! Price guides tout this one as a rarity. However, it seems it was a card free for the asking, if you wrote the GM a winning letter!